You may have noticed I am a little obsessed with popcorn. I’ve recently made Reese’s Peanut Butter Cup Popcorn and Twix Caramel Popcorn. I am having way too much fun with popcorn:) My latest creation is Salted Caramel Easter Popcorn. This popcorn is magical. There is something about it that will not let me stop eating it. I haven’t figure it out yet, so I keep eating. It is part of my research:) I am getting closer though. I think it has something to do with the caramel marshmallow popcorn that has a kick of sea salt, pretzel pieces, and Pretzel M&M’s. All of those ingredients in one popcorn bowl can only lead to addiction. I love a good sweet and salty treat and this popcorn has the perfect balance of sugar and salt. The popcorn and pretzels get drenched in a salted caramel marshmallow mixture. I added a little red food coloring to turn the popcorn pink for Easter. You can use a different color or just leave the popcorn plain. I also stirred in Easter Pretzel M&M’s. They add a nice pop of spring color and the chocolate salty crunch goes nicely with the popcorn. 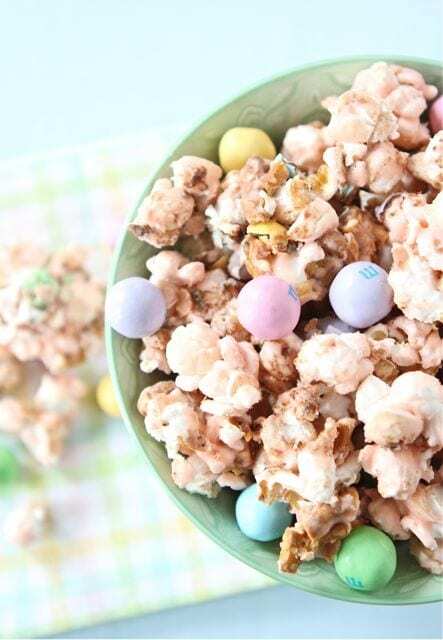 This Salted Caramel Easter Popcorn is a great spring and Easter treat. You will want to eat the entire batch all by yourself, but try to resist because this popcorn makes a great gift. Place the popcorn in bags and tie a pretty little ribbon around the end and you have a festive homemade gift. You can also put the popcorn in little Easter eggs and hide them or add them to an Easter basket. Get in the Easter mood and make a batch of this Salted Caramel Easter Popcorn. It is easy to make and fun to share and to munch on! 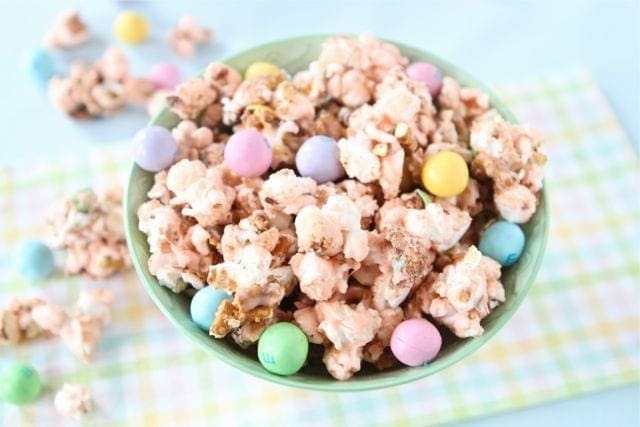 This sweet and salty popcorn treat is perfect for Easter and spring time snacking! Note-I used air popped popcorn, but stove or microwave popcorn will work as well. I used red food coloring to make the popcorn pink for Easter. I also used Easter Pretzel M&M's. You can always change up the color or leave the popcorn plain. And feel free to stir in your favorite M&M's or other Easter candy. Robin Eggs or Mini Cadbury Eggs would be good too! You’re so creative with your popcorn! I love this… and am pretty sure I’d eat the entire thing myself! This is GORGEOUS!! We’d LOVE it for Easter!! We love popcorn, too, and this one looks beautiful and delicious. oh looks great, I get nervous with these popcorn recipes they look like something I would not share, and that is not good for the figure LOL. I’m a sucker for everything salty-sweet! This looks like the perfect movie night treat! Yum! What a fabolous recipe and the photos are gorgeous! I would love some of this popcorn, like right now!! What a fun looking Easter treat! Oh. Yum. I’m so in trouble with this one. What could possibly be better with popcorn and Mini Carbury Eggs than salted caramel. And since most of the treats in this years Easter Baskets are going to be homemade, thank you for the wonderful idea! So perfectly fun and festive for Easter., Maria! What a fun Easter recipe, and so colorful! This is a great snack idea. Thanks, Maria! Just literally read Jenna’s post about funfetti popcorn and now this! I’m in popcorn heaven today! Usually I have to be in the exact mood for popcorn but when you add funfetti or caramel or chocolate, it becomes much easier to convince me to have some 🙂 Love this! Oh this just looks flipping fantastic! You are the popcorn recipe queen! I love the little pastel candies in these. So adorable for Easter. I am so excited to make this today for my kids after school snack. They will be tickled pink. You can never go wrong with salty and sweet – love this Maria! I think I know what one of our General Conference treats will be now! Keep the popcorn recipes coming! Yummy! I love the pastel colored M&M’s. So festive and springy! Certainly nothing wrong with being obsessed with popcorn. I love the variations you’ve shared with us. Thanks! OH MARIA!!! you are crushing me with fantastical popcorn creations! All this caramel corn is my kryptonite! This popcorn would be a big hit in our house! I love how festive it looks too. We are cut from the same cloth Maria. I am loving everything on your blog lately, and I ADORE popcorn so I can’t wait to try this! This is so cute… I am definitely making this! The color alone would keep my hand in the bowl. Caramel popcorn was always my favorite as a kid and I sadly have never made it home made. I love the peanutty m&ms that you have with the popcorn…it’s like trail mix but way better! 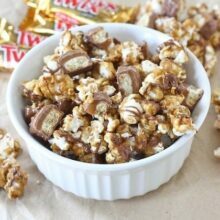 I really love this snack recipe, mostly because I am so indecisive at times, I have no idea is I want salty or sweet, so this is the perfect solution, thanks for the post the twix caramel popcorn looks awesome too. What a delicious and simple popcorn treat! Looks addicting. LOVE LOVE the Snickerdoodles!!! Yummy! Your next cookbook should be a popcorn cookbook!!!!!!! This looks AMAZING and super PRETTY! I want to try it! This popcorn looks scrumptious! Can’t wait to try it. You are so creative with your recipes! Great idea for Easter! Although I’m thinking I may wait until after Easter, melt all the candy, and pour it over popcorn! So you’re officially both the cookie AND the popcorn queen! That is a lot of titles to hold…but you so deserve it. This sweet/salty festive blend looks amazing! This is crack any way you look at it! I would jump right in that tub. I’ve been meaning to make caramel corn again for some time now…this looks like just the perfect way to do it! this is the perfect Easter afternoon snack! I love that salty sweet combination too. I think this would be gone in a bout 3 seconds flat at my house. It will stay good 3-4 days as long as it is in an air-tight container. Enjoy! White Chocolate popcorn is a favorite in my family. It is so simple…two microwaveable bags of the Tender White Popcorn and one bag of white chocolate chips or one bag of your color choice of candy melts. Pop the popcorn and melt the chocolate. Stir together and lay out onto wax paper to allow chocolate to dry. MMMM!!! Love this idea! I was eating the M&M’s one day and had the thought of having popcorn with them. Now I will have to make some. I have been going through bags of Kettle corn recently…it’s my new favorite TV snack. Love this recipe! Yummy popcorn! We made birthday cake popcorn for the Oscar party we attended and that went over very well… this one would be great to try for a movie night! If you have to have an obsession – popcorn is a good one to choose! This looks amazing!! So festive too! Wonder if we could make this a few days ahead (in bulk) and use this at my daughter’s outdoor casual wedding? Do you think it would stay fresh? Yes, you can make it in advance. I wouldn’t make it any further in advance than 3-4 days though. I just made this and followed the recipe to a T. (it’s hard to measure out 6 cups of popcorn but we popped 1/2 cup on the stove in oil, so I’m sure it’s about 8 cups maybe). This is very good. It has no specific flavor, I’d say, but it’s sweet and “caramaly” flavored. The pretzels and m&m’s are necessary, in my opinion. They really give it a nice balance. The pink is also necessary. We did 2 drops of NEON pink and it’s so stinkin’ pretty! Thanks for the recipe. Can’t wait to serve it tomorrow for our guests and make it again for the Easter party next weekend! Thanks for linking up Maria! Recipe says “pretzel M & M’s”. Do you mean peanut ? Thanks for all your wonderful ideas. 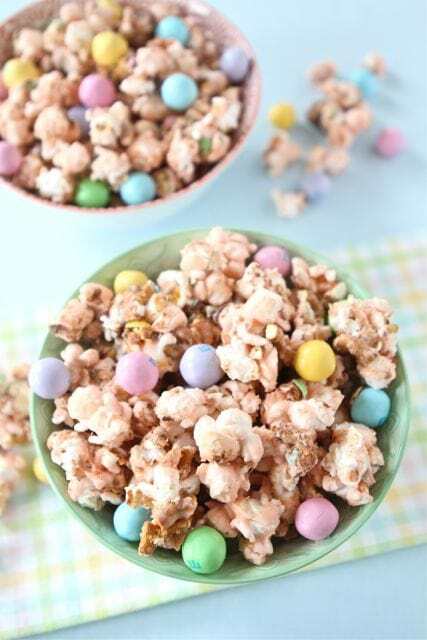 Gonna make this today, and probably have to do it again before Easter for I am a popcorn freak also! Happy Easter to you and yours! I used pretzel M&M’s, but if you prefer peanut you can use those! I’m not what I did wrong, but it came out so sticky and never really hardened like carmel popcorn. I wanted so badly for this to work to take to the office. Any suggestions? Maybe you didn’t boil it long enough? I pulled it off at 250 degrees (hard ball stage). your directions said Amber in color, which I always thought was burning the sugar. Such a cute recipe!! I’m making it right now! When do you add in the food coloring? When you are mixing in the marshmallows. See the recipe. How long do you think this would stay fresh for? I wanna make some for my nephews for Easter, but I wanna try to do some of the food prep ahead of time, so I don’t feel like a crazy lady on the day of. You can make it 3-4 days ahead of time. Just keep it in an air tight container. Enjoy! I gave this recipe a try this weekend. Great ingredients, but it ended up being something more akin to Rice Krispie bars–sticky everywhere–than the great photos you have above. Don’t get me wrong, my co-workers still devoured them (even after a few more than one drop of red food coloring left everything an interesting shade of crimson). But any thoughts on what I did wrong, and how to keep the result from being so tacky? The popcorn sticks together so you will have clumps, you can break them up though. Does anyone know how long this will last? Can I make it and store it? It will last for 3-4 days if you keep it in an air tight container! Ours didn’t last that long though:) It is addicting! I lovvvve the way this recipe looks (among all ur others! Wow!) but when I made it, the caramel coating stayed sticky?! I thought this would be a dry-ish treat that little hands could handle without a mess? Help! What did I do wrong?! Did you let it cool/dry on a baking sheet? It should be a little sticky, it is caramel corn, but not a mess. Tried to make 2 batches tonight and had a caramel problem both times 🙁 its to sticky. I can’t bag it for presents like I planned. Any suggestions? 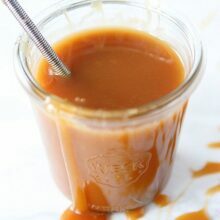 Cook the caramel longer? To what temp? Help! Did the caramel turn amber in color? Did you let it cool completely on a large baking sheet? It will get harder as it cools. It will be a little sticky-it is caramel corn, but you should be able to bag it. Sorry you had issues! I had a problem with the caramel too. It tasted sort of bitter. I have it on the cookie sheet cooling now, but I don’t think I got a good flavor. And for some reason my food coloring didn’t change the color of the popcorn, it just plopped!! Ugh, but yours sure looks pretty!! Ours was not bitter at all, only sweet and salty. I only added a little food coloring. I wanted it to be a light pink color. I just made this last night! It is beautiful and scrumptious! However, my caramel hasnt completely hardened:/ Do you think I did something wrong? I am not sure why the caramel didn’t harden for you. It was still a little sticky for us, but not bad. Where do you live? Utah is dry so maybe it cooled differently? Not sure! Sorry! I had the same issue with the carmel. Could you publish a temp the sugar mixture should reach? The taste is GREAT, just very sticky! I have never tested the temperature. I will have to do that next time we make it. Ours was sticky at first, but after it cooled completely, it hardened up a bit. Maybe Utah is dry so it hardened up? I am not sure! Glad you still liked it. …by the way, my popcorn hardened wonderfully!! Not a problem — and my husband, when he came home from work and taste tested, said he didn’t think it was bitter at all!! Must have been my taste buds. But I wonder if I added too much food coloring and maybe that impacted on the flavor. But I am making this again today!! thank you so much! Oh good! Glad you enjoyed it! DO you stir the mixture until it boils, THEN leave it undisturbed, or basically dont stir it at all? Thanks, looks awesome! Leave it undisturbed. Just watch it so it doesn’t burn. You want it to turn amber in color. Enjoy! I made two batches as directed and both turned out really gooey, even after cooling completely. I hated to throw it away, so I decided to try baking it like traditional caramel popcorn, and that did the trick! Came out perfectly… I baked it at 250 for about 45-60 minutes. I used whipping cream instead of heavy cream. I used 2 king-sized marshmallows (cut-up) instead of mini marshmallows. If you can overcome your aversion to having this mixture stick everywhere and to everything (think Rick Krispie treats on steroids), MAKE THIS! 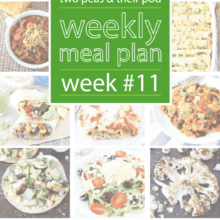 We just made this and it is SO delish! My question is, yours looks a little more dry and crunchy. Ours turned out more gooey and sticky. Is that how yours ended up? Any ideas as to how to make it more crunchy? Mine was sticky at first too. Let it dry completely. It should harden up! Happy Easter! Just made this for second time ( first time caramel burned) 2nd time better but ours tastes bitter as well & food coloring did nothing bc already caramel colored turned to amber very quick. Not sure if it’s the vanilla making it bitter- we’ll see how the nephews like it tomorrow. WOW! Made it on this Easter morning! I was hoping to cut calories from the chocolate overload by making a popcorn dessert! But it’s so addictive it’s hard to stop snacking on it! Here in Manitoba, Canada I couldn’t find the Easter Pretzel M&M’s so I added one cup of chopped white chocolate covered pretzels and one cup of regular pretzels. I also added one cup of candy covered chocolate mini eggs and a cup of Spring Pastels M&M’s to the mix, then drizzled dark chocolate over it! This is the start of a new Easter tradition! Love your site! I just love all your blog!!! I made this today, but my popcorn never got crunchy, it stayed sticky….what do you suppose I did wrong?? I just made it all into popcorn balls, and it was still oh so yummy!!! I would like to know how to fix it for next time though. Thanks! This looks perfect 🙂 planning on making this soon…is the popcorn crunchy or more chewy like a Rice Krispie treat? How much ahead can i make this? I just scarfed down a bag of Harry and David Moose Munch. Not going to lie I would like some more. This would be great for our guests(and me) next weekend. Pingback: HUEVOS | Compartimos un brunch? wow – just made this and it was a total flop. so disappointed! So I’ve made this a couple of times, thank you very kick for the recipie, but my popcorn always goes a kind of soggy and loses its crunch. Am I doing something wrong or is it the wrong type of popcorn… Help please! 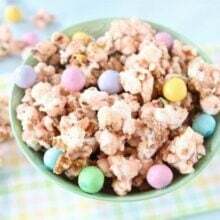 Thank you so much for this Easter popcorn I am going to try this, and would be great to have at a baby shower and you could do like you said and used any color you wish, this is going to be so good…I can not wait to try it! thanks a lot!!!!! 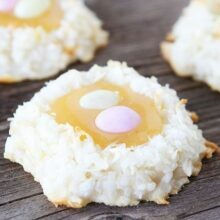 Pingback: 25 Adorable Easter Recipes! Pingback: 100 Easter Ideas - Decorating, Food and more! Mine stayed quite soggy too 🙁 Tastes great though! I couldn’t use it for what I planned but I will take a cue from others who had disappointing results and make popcorn balls instead. Is this supposed to come out super sticky? I was anticipating a crunchy/dry caramel corn, but when I made this it came out really sticky. I’m not sure if I did something wrong or this was just a different type of caramel corn (like one to make into balls) than I was expecting. Pingback: Garlic Butter and Herb Popcorn | Never Enough Thyme — Never Enough Thyme - Recipes with a slight southern accent. I think this recipe maybe has a missing part..should it have been baked before adding M&Ms? Based on the many responses and my own experience, this popcorn doesn’t harden which just makes for a messy sticky glob? Maria, I love your recipes but this one needs to be revisited. wow the tuned popcorn right? hahah salted caramel is amazing! You make the recipe really? Sweet popcorn is a wonder . I was willing to do! Pingback: Easter Treats Recipes – Your Kids will Love them! This recipe was a giant waste of time and money – I’m so disappointed. The caramel mixture was so gooey and it never hardened properly. It was just one giant tray of gloppy, wet caramel. I’m not trying to be mean, but be warned – this was bad. Do NOT make it.